Click here to read the story of the flag raising on Iwo Jima, as remembered by the photographer Joe Rosenthal. "There is no Jap navy here to stop us; no Jap air force, either... So you see Jap? On our way up here to Iwo we flew over more supply ships, more cargo carriers. Those decks carry concrete mixers, Diesel-powered road crushers and rollers. There aren't many cliffs on Iwo to hide out in, Jap! 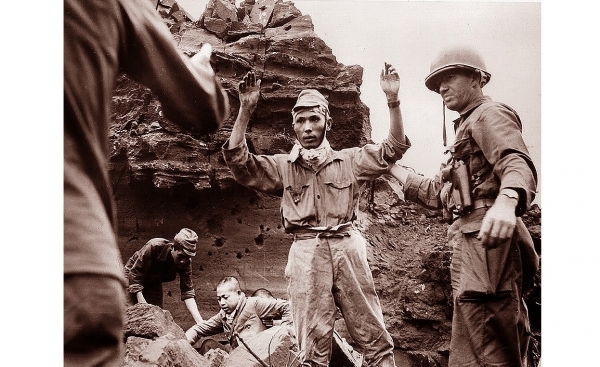 You can't live for weeks in the crevices of Suribachi. You can't grow gardens on that rock. So, while you can still see, look down at what we're seeing: An American city, a harsh, womanless city is moving in on you." Davenport's observations were no doubt a comfort to the Collier's readers on the home front, but post-war accounting revealed that one quarter of the U.S. Navy's losses took place at Iwo Jima and Okinawa.